Two young fiddlers from the American mid west, well Indiana and Wisconsin at least, this duo has adopted the music of the old country with gusto. Surely exposed to old-time and Scandinavian music but brought up in the Irish tradition, Nathan and Laura have been playing together for six years at sessions, festivals, and basically any decent excuse, and it shows. Their duets are precise and powerful, needing little in the way of backing from Brian Miller. The solo tracks are equally impressive, with individual style as well as convincing emulation of past masters. Twin fiddles gives plenty of scope – octave harmonies on Bundle and Go, counterpoint on The Crib of Perches, ringing harmonies onPadraig O’Keeffe’s Polka and tight unison on The Old Wooden Bridge which is a Vincent Broderick composition new to me. There are some inspired tune choices here, and some delicious changes into The Star Above the Garter, The Heather Breeze and others. Life is All Checkered is honest to goodness traditional fiddling through and through, switching between the earthy and delicate styles of Donegal and Clare, Kerry and Dublin. Gourley and Feddersen stick mostly to the old tunes, from the slightly hackneyed Blarney Pilgrim to classics such as The Berehaven Reel or The Graf Spee. There’s both quality and quantity here, and even with such sparing accompaniment there’s no danger of boredom with this recording. Reels and jigs, airs and hornpipes, polkas and slides: all are played with depth and feeling, and with a freshness which polishes up even the dustiest old melody. There is a slight preponderance of reels, but you can’t complain at that when they are delivered with the brilliance and beauty of the final Road to Garrison. Laura and Nathan were a new discovery for me, and I hope we’ll be hearing more from them in the near future. This week I’ve turned my attention to an album that I think is really quite special called “Life Is All Checkered,” the new release from fiddlers Nathan Gourley and Laura Feddersen. For many, the names Gourley and Feddersen might fly a bit under the radar, but make no mistake, this is a must-have album from a pair of brilliant player who deserve wider renown. Gourley and Feddersen are based in Boston, but both in fact hail from the Midwest. Most of the album’s tracks also include Brian Miller (www.evergreentrad.com) on guitar or bouzouki. A member of the group Bua, Miller has released a couple of outstanding albums on his own and here, he adds rock-solid harmonic and rhythmic backing. Miller is a top-tier player whose tasteful approach supports the melody playing in a very thoughtful way. He’s a great addition. “Life Is All Checkered” is a great album of fiddle music from two kindred players who sound amazing together. 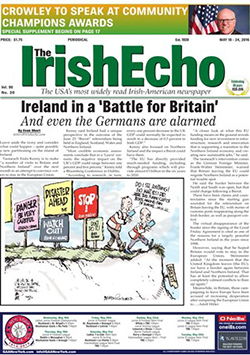 The tunes are well chosen, they are brilliantly played and represent the great good health of traditional Irish music being played in the United States. Highly recommended! Ok, first things first here – why haven’t we heard of Nathan Gourley and Laura Feddersen before? Here we have two fabulously proficient fiddle players. As a duo they demand your attention and hold it for all of the 15 tracks on debut album Life Is All Checkered. Having grown up in musical families in America’s mid-west and now residing in Boston MA, the pair have been playing concert halls, pubs and park benches for a good while but it’s only now that they’ve committed their undoubted talent to disc. Predominantly Irish in style, the pair take the traditional music of the Emerald Isle and run it through with an American heartbeat that is all their own. 15 tracks might sound like a lot to absorb in one go but the tunes are short, sharp and to the point! All 15 tracks are of the highest quality both in terms of tunes and the accomplishment of the musicians. Accompanied by Brian Miller on guitar as required, the pair hurtle through a multitude of jigs, reels and hornpipes with astonishing finesse and speed. Only on Lament For O’Donnell does the pace slow. The tune is a beautiful slice of melancholy that evokes its Celtic roots whilst simultaneously being evocative of a sound that is unmistakably mid-western American. The pace doesn’t slow for long though as Lament For O’Donnell segues effortlessly into the mid-paced stomp of The Star Above The Garter. It’s a beautifully uplifting record from start to finish and is released perfectly to coincide with the coming of Spring. If daffodils and blossom trees could play music this is exactly what it would sound like, and if you wanted to soundtrack the joy that comes with the clocks going forward you’d probably be hard pushed to find a better fit than Life Is All Checkered. Right through to the closing gambit of the well-known hornpipe and reel combo of The Blackbird/The Road to Garrison, Gourley and Feddersen entertain with a charm and passion that is often missing from similar acts. The duo are a practically perfect pairing of musicians and have presented us with an equally perfect example of how the Irish musical tradition is interpreted in America. Irish music has an unerring habit of percolating its way throughout nations and cultures. No surprises there. Few countries have spread their children so far and wide across the planet, and few possess such an affinity for retaining their heritage. Musicians from almost every nation have absorbed its eternal memories and reflected them through its music. In the greater scheme of musicians that play the music of Erin’s Isle, Nathan Gourley and Laura Feddersen are right up there with the best. Their album ‘Life Is All Checkered’ is a delight – start to finish. Gourley and Feddersen present enthralling twin fiddling, ranging through intricate synchronisation to chordal harmonies, rhythmic and melodic variations, while Miller strokes out chords and driving rhythms on guitar and Greek bouzouki. This is a fervent slice of Irish tradition served up from the depths of their American roots. With music flowing through their veins coupled to an obvious and abiding love for and deep understanding of Ireland’s tradition, Gourley and Feddersen’s album is evidence of a singular musical pedigree. It’s also an album that engages on every level. Your alternatives are sit back and let the music weave its magic or indulge your urge to join by executing a lively step. Whatever takes your fancy, the only real measure is to realise that ‘heard once’ this music will be with you for a long time to come. Gourley, Feddersen and Miller explore their catalogue of Irish music from ‘The Bachelor/ The Flogging Reel’ through ‘The Coalminer’s/ Trip to Nenagh/ The Blockers’ and ‘Lament for O’Donnell/ The Star Above the Garter’ to ‘The Cocktail/ Bill McEvoy’s/ Blackberry Blossom’ and ‘The Blackbird/ The Road to Garrison’. Any album of Irish music requires sympathetic production to complement and augment the musicians’ work and make it ‘live’. It’s said if you can ‘feel’ the music just as you would in a ‘live’ environment then it works to perfection. That’s precisely what you get with ‘Life Is All Checkered’. Life is all Checkered is the new duet album by Nathan Gourley and Laura Feddersen. 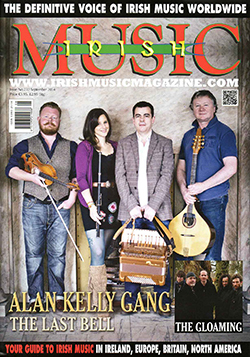 Its strapline reads ‘Traditional Irish Music on Two Fiddles’ and it is the surprise recording from the end of 2014. The US produced some great recordings last year and this is top of the pile. It shows that new life exists within many an old tune. Nathan and Laura through years of playing together and some inspired arrangements have found some new avenues of musical expression that underpin the recording. The use of complementary drones and chordal harmonies overcome any issue of one fiddle canceling the other. In addition the rich sound that they have extracted from the fiddles in the recording process gives it an extra layer of texture, setting everything at a perfect earthly timbre that matches the mood of the music.